The aim of this study is to determine if urodynamic findings in patients with urge incontinence predicts response to sacral neuromodulation test stimulation. One hundred four patients with refractory urinary urge incontinence who had undergone sacral neuromodulation test stimulation were retrospectively reviewed. Pre- and post-test stimulation incontinence parameters and pelvic floor muscle (PFM) contraction strength was documented. 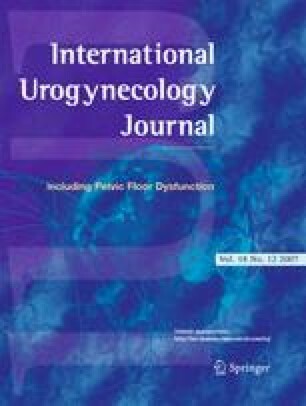 Urodynamics were reviewed on all patients, and the presence or absence of detrusor overactivity (DO) was noted. Patients were then divided into two groups: responders to the test stimulation and non-responders. A positive response was considered to be a ≥50% improvement in the number of incontinent episodes per day (IE/day) and/or pad weight with test stimulation. Of the 104 patients evaluated, 64% (N = 67) responded to the test stimulation, while 36% (N = 37) were non-responders. The mean age was 59.7 and 67.0 among responders and non-responders (p = .01). There was a significant difference in the number of IE/day between non-responders and responders (p = .02). There was no relationship found between the presence or absence of DO and the likelihood for test stimulation success, patient demographics or pre test stimulation incontinence variables. Our study provides no statistically significant evidence that the presence or absence of DO on urodynamics predicts a response to sacral neuromodulation test stimulation. An important finding, however, was that patients without demonstrable DO on urodynamics may still have a positive response to sacral neuromodulation.